My cousin and her husband were visiting us from San Francisco a couple of weeks ago. We only had a couple of days together, so we tried to spend as much of it together as possible…this meant just hanging out and eating at home. My cousin’s husband is gluten free (as are we these days), so my mom put me in charge of dessert. I made my peanut butter oat bars as well as this cake (because not everyone likes peanut butter). I have to admit, I cheated a little with this recipe. I bought a gluten free cake mix and modified it to make it extra tasty. The best part is that I only used half the cake mix, so I was able to get a second recipe out of it! Woooo hooo! Pre-heat your oven to 350 degrees and grease an 8.5 x 5.5 inch loaf pan. Set aside. In a large bowl, whisk your dry ingredients (cake mix, jello mix) together. Take 1 tbsp of your dry mixture and sprinkle over your blueberries. Whisk your wet ingredients (eggs, 2 tbsp water, oil, cream cheese) together and pour over your dry ingredients. Mix well. It should come together rather quickly. Add 2/3 of your blueberries to the batter and combine. Place your batter in your prepared loaf pan and spread evenly. 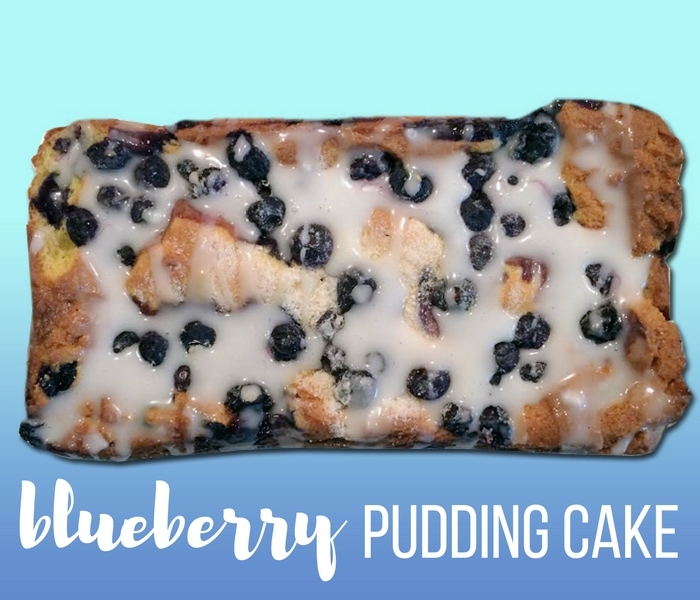 Sprinkle your remaining blueberries over top of the batter. Bake for 40-50 minutes, until a toothpick inserted in the center comes out clean. Once your loaf is cool, combine your powdered sugar with the remaining 2-3 tbsp water (add one tbsp at a time until you get the consistency you want). Pour over top of the loaf and allow to sit for another 5 minutes before serving.